Alfred's Kid's Guitar Course Book 1 method with CD and DVD is the No. 1 best-selling guitar method for kids! This award-winning method ("Best Product of the Year" ---Disney's iParenting Media Award) is the easiest guitar method ever for kids ages five and up. Kids learn to play chords and melodies, read music, and perform lots of fun songs. Book 1 starts by teaching you how to hold the guitar and tune the strings, and by the time you finish, you'll be strumming chords, reading music notation, and playing lots of familiar songs. The book comes to life on your stereo and your computer with the enclosed enhanced-CD. The companion DVD to this best-selling edition features a live instructor to make learning the guitar even easier! Alfred's Kid's Guitar Movie & TV Songbook includes fun arrangements of favorite movie and TV songs to make learning even easier. The included CD includes every song for listening and playing along. Titles: Beauty and the Beast * Fawkes the Phoenix * Over the Rainbow * Theme from Superman * This Is It! (The Bugs Bunny Show) * A Whole New World (Aladdin) * Yoda's Theme (Star Wars) * You've Got a Friend in Me (Toy Story) and many more. 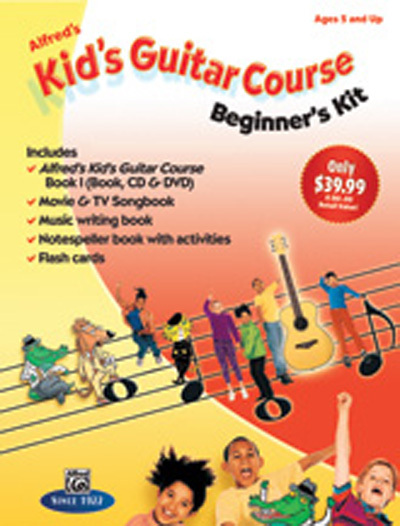 Alfred's Kid's Guitar Course Music Writing Book allows you to practice composing your own musical creations. Containing 32 pages of 6 staves each with wide spacing, the included guide to writing music helps beginners get started and is a perfect complement to the method! Alfred's Kid's Guitar Course Notespeller will add excitement to the learning process. Covering all the concepts in the guitar course, this is the perfect complement to the method and learning how to play guitar.